Laika the Soviet space dog. The first animal to reach Earth Orbit. November 3 marks the anniversary of the first animal in orbit. On November 3, 1957, the Soviet Union launched the second of their satellites: Sputnik 2. This satellite was originally designed to measure solar irradiance and cosmic rays but Soviet leadership wanted a grand spectacular event to impress the world. They modified their satellite to carry the first space dog known as Laika. They wanted the launch to correspond with the 40th anniversary of the October Revolution. Unfortunately, no satellite was available to meet this deadline. The engineers quickly modified the only available satellite to carry the equipment necessary to carry a dog, extra oxygen, and monitoring equipment. The Soviets had been launching dogs on rockets since 1951 in preparation to send a man into space. 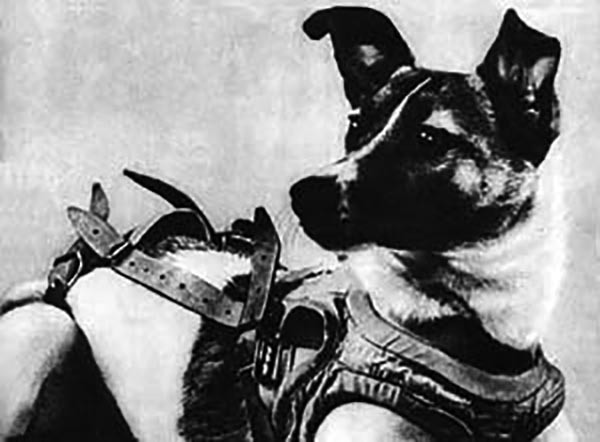 Twelve other dogs had reached sub-orbital space before Laika. One of these dogs, Albina made two of these flights and was slated to be Laika’s backup. Another dog named Mushka served as a control dog and trained with Laika and Albina. The training involved confining the dogs to increasingly smaller cages until they could tolerate being kept in the confined space of the capsule. During liftoff, Laika’s respiration rate increased to three times normal and her heart rate doubled but settled down once she was weightless. Between five and seven hours later, no further data was received. Initially, the Soviets reported Laika was euthanized as planned with poisoned food or she died of asphyxia when the power failed. It wouldn’t be revealed until 1999 that there was a problem when the satellite was separated from the booster. The booster did not separate cleanly when the satellite was ejected and part of the thermal control system was torn loose. The cabin temperatures reached up to 40 °C and Laika overheated and died during her fourth orbit. Laika returned to Earth five months later. Sputnik 2 burned up on reentry after 2,570 orbits on April 14. 1994 – Ralph Walter Graystone Wyckoff died. Wyckoff was an American scientist who was a pioneer of x-ray crystallography of bacteria. He also developed a method of three-dimensional electron microscopy called metal shadowing. He placed a biological sample in a vacuum next to a gold plated tungsten filament. When the filament was heated, the gold would vaporize and coat one side of the sample. The other side would be shadowed from the gold and would reveal details of structure, size, and shape. 1973 – NASA launches Mariner 10 probe to Mercury. NASA’s Mariner 10 mission launched from Cape Canaveral to begin its mission to the planet Mercury. The probe was the first to visit Mercury. It was also the first spacecraft to use the gravity of one planet (Venus) to reach a second planet. Mariner 10 made three flybys of Mercury and mapped approximately 45% of the surface through 2,800 photos. It also discovered Mercury has a thin atmosphere of helium, a magnetic field and evidence of an iron core. It also showed the surface temperature ranging from -183 °C at night and 187 °C during the day. 1957 – The first animal in space reaches orbit. 1854 – Jokichi Takamine was born. 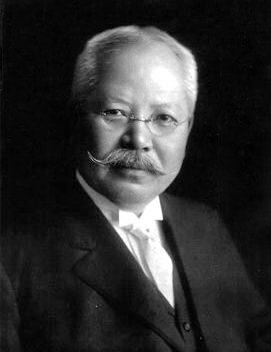 Takamine was a Japanese-American biochemist who was the first to isolate the hormone adrenaline, or epinephrine from the suprarenal gland. It was the first pure hormone to be isolated from natural sources. He also isolated the enzyme takadiastase which catalyzes the breakdown of starch. The flowering cherry trees in West Potomac park of Washington D.C. originally came from a gift from Takamine and the mayor of Tokyo in 1912. These trees were donated to “enhance the growing friendship between the United States and Japan and also celebrate the continued close relationship between the two nations”. There was an original gift of 2000 cherry trees in 1910, but the trees were found to be infested with agricultural pests. All 2000 trees were burned to protect the local environment. Takamine arranged a second delivery of 3020 cherry trees grown from the world famous Tokyo cherry trees. The first two of these were planted by first lady Helen Herron Taft and the wife of the Japanese ambassador to the United States on March 27. This event is celebrated every year during the National Cherry Blossom Festival. 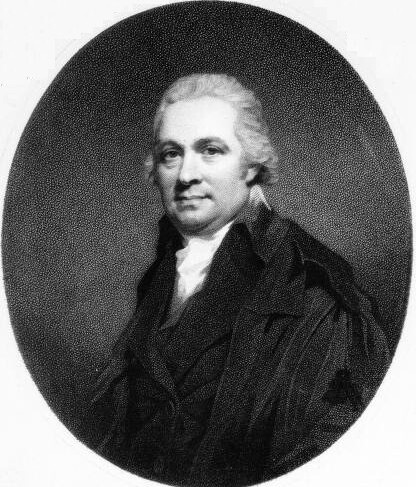 1741 – Daniel Rutherford was born. Rutherford was a Scottish chemist who discovered and isolated nitrogen gas. He kept a mouse in a container of air until it died, burned a candle until it was extinguished and finally burned phosphorus until it would not burn anymore. He passed the remaining gas through an alkaline solution to remove any carbon dioxide. Rutherford called the remaining gas “noxious air” or “phlogisticated air” because it would not support life or combustion.